78s, LPs, CDs, reel-to-reel and cassette, laser disc and DVD – if you collect recordings of classical music and you are an audiophile you really need to have the ability to play all of these in your audio system (and I missed out cylinders and 8-tracks, but enough said…). Or do you? Nearly everything is now available in digital format, and Google usually takes only 0.46 seconds to find it. I could, for example, listen to Mosolov’s Steel Foundry recorded in 1936 by the Orchestre Symphonique of Paris conducted by Julius Ehrlich on-line. But that really isn’t the same as gingerly lifting out of its sleeve the incredibly rare original 78 I brought back from the UK this summer (triple bubble-wrapped in my suitcase), putting it on the 78 turntable, and listening to the clamorous, motoristic cacophony as it was heard and recorded eighty years ago. There is, of course, something about the tactile quality of handling real physical media that makes it so satisfying (my favourite, I think, is a 10-inch reel-to-reel tape recorder doing its stuff, though I have a soft spot for laser discs). Then there is the vexed question of the sound quality, or rather the timbre of the sound quality. I still haven’t heard anything yet as aurally effective as a really good LP played back on a really high quality turntable, or for that matter a really well recorded reel-to-reel tape, and I am not alone in that. Consequently, I have playback systems – almost all bought used – for all the various types of recordings a century or so of engineering has issued. But the musical sirens call, and I am not very good at putting wax in my ears or tying myself to a mast (as Ulysses did to resist them). Most of the audiophiles I know here in Edmonton have at least been tempted to dabble in the new world of high-bit rate audio streaming (or downloading), and some have turned their recorded music into digital format to reside in file format on a music server. And I have to admit it, discovering the amazing Meridian Reference system in one of my local audio stores, with its beautiful design, neat screen, file storage system, its internet connectivity, and its pretty amazing sound, and Phthonos (the Greek god of envy and jealousy) is there standing alongside the sirens. I don’t particularly desire to turn all my CDs into files on a music server: the mind boggles at the time it would take, and anyway, I like the silver discs. I like being able to look along rows of them on the shelf, and I like a proper booklet to hold in my hands and read. But there is also a good reason to dabble. For casual classical music listening – and to discover, at random, or rediscover works and performances I did not know – radio has always been my preferred format, and, until a couple of years ago, all I had to do was switch on CBC Radio 2. That possibility is no longer there – at least, not with any degree of equanimity – thanks to the aberration our public radio broadcaster has now become. The internet, though, has opened up an almost unheard-of ability to listen to classical music (and of course, every other genre) from all those myriad of countries that do still have radio stations that believe in quality. I started off by discovering TuneIn radio for my smart phone, originally to listen in the car to the best news service available, BBC World. That led me to exploring the multitude of radio stations available (‘A’ Net Station from Antarctica was irresistible), and that to thinking about fitting something to my main stereo system. I could have bought an off-the-shelf internet tuner, but first that seemed a bit inflexible, and second, I wanted to try the high bit rates that many internet stations now stream in. For the uninitiated, I won’t go into all the technical details here (there’s plenty on the web to explain it), but very high bit rates translate into very good sound, at its best of a higher quality than CD. I could, of course, also have bought the beautiful Meridian system, but I would have been in debt for the foreseeable future if I did. So I decided to take a simpler, and much cheaper route. Build it yourself. I put together a good PC computer for about $300 with a large hard-drive and Windows 7. An old flat-screen monitor was all I needed. So that was the first requirement. The second is that you want to avoid the less-than-ideal audio components in a desktop computer, so you have to connect it to a suitable DAC. I already had one – the excellent DAC Magic Plus from Cambridge Audio, used for my CD transport. It comes with a suitable USB port, and PC software to direct the digital audio signal from the computer to the DAC (thus avoiding those less-than-ideal PC electronics) and has the ability to convert those higher bit rates into meaningful analogue signals. Add a suitable player to the PC (I use the excellent and free VLC media player). Phthonos was banished. I was streaming all sorts of concerts, operas, and the occasional heavy metal through my audio system. And it sounded pretty good (more on which later). But… I ended up never really using it. Windows 7 takes a long time to load (so much for casual listening), I had to have a wireless mouse and a keyboard, which cluttered up the living room, and which I was forever putting away and not remembering where they were, and when I did find them I had to perch them on my lap. It was all a little clumsy, and, well, a little ugly. I have to regularly use the huge and brilliant Naxos Music Library for my work, so I used the system for that, but it was all a little bit of a sweat, and – well, just not relaxing. Then, about a month ago, everything changed. I wanted to load Windows 8 into my study work computer. But to take full advantage of what (once one gets one’s head around it) is the best Windows operating system since 3.1 meant getting a touch-screen monitor, so I ordered an ACER T232HL 23” monitor at an advantageous price from newegg.ca. As soon as I opened it up, I knew it wasn’t going to go anywhere near my study desktop. It was just too drop-dead gorgeous (the photo doesn’t do it justice) and I instantly realized that where it belonged: with my unloved music server PC. And that was where Windows 8.1 was going to be loaded, in the place of Windows 7. It has, as they say, changed everything. Windows 8.1 starts up almost immediately, so that problem was solved. 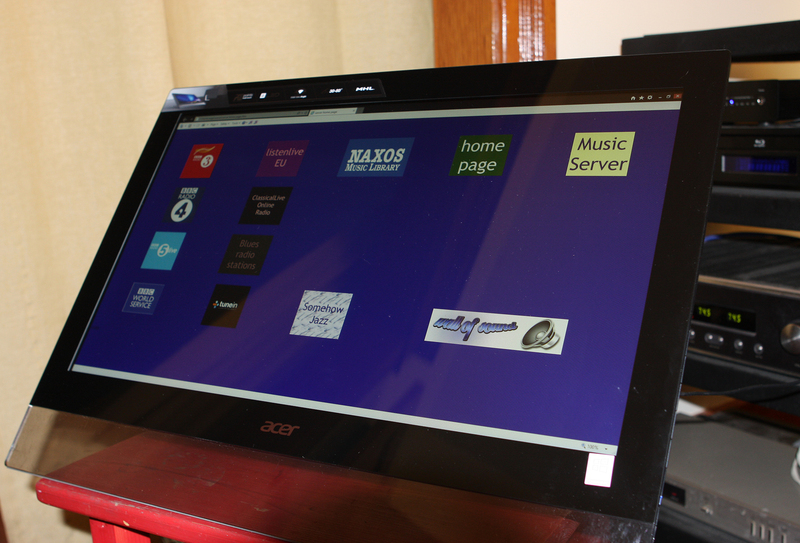 But it is the large touch screen that makes everything viable, and well, just satisfying. Is it getting rid of the mouse and keyboard (since I am not writing on the computer, neither are needed); is it the ease of wandering around the air waves; or is it the pleasure of the tactical touch as you summon up Swiss Radio Crazy Opera, or listen to BBC Radio 3 live – or explore the Naxos Music Library? I don’t know – I simply know that it works, and that when I get home, on it goes. I do have some audio files on my computer – the ‘music server’ part of the equation – but they are incidental. The Naxos Music Library, with its 105,950 CDs and counting, is enough for me. The point of building something like this is the internet, pure and simple. And since it is also a computer, I can quickly look something up (about a composer, for example) while I am listening (hugely useful for a music critic!). And how good is the sound-quality? At its best, excellent, and certainly as good as most CDs: in other words, it by and large also satisfies the audiophile in me. Or to put it another way, a good quality stream allows me to revel in the music without feeling I am compromising on the sound. Operas from Swiss Radio Crazy can sound truly marvellous (it’s playing right at this moment as I write this), and the BBC broadcasts in high bit-rate are as good as one would expect from that source. They all do, though, sound slightly dry, in the way CDs (compared to LPs) can also sound dry. That may be simply be the nature of any digital sound in the current state of technology, but it is noticeable that the best BBC live digital concert broadcasts simply don’t sound quite as good as the analogue BBC live concerts I recorded on a reel-to-reel before they went digital. The sense of space isn’t quite as pungent, the subtleties of the timbre of, say, a woodwind instrument isn’t quite as palpable (and these, of course, are exactly the complaints of CD vs. LP). It may also be, of course, that upgrading my DAC might also help solve this – so, having read Tim Smith’s rave review of the Musical Paradise MP-D1, and since they are sold here in Edmonton, I went out and bought one – and the results are in Part II of this story. But whether we are die-hard analogists or not, there now exists a new source component that any lover of music (of whatever kind) should really have. 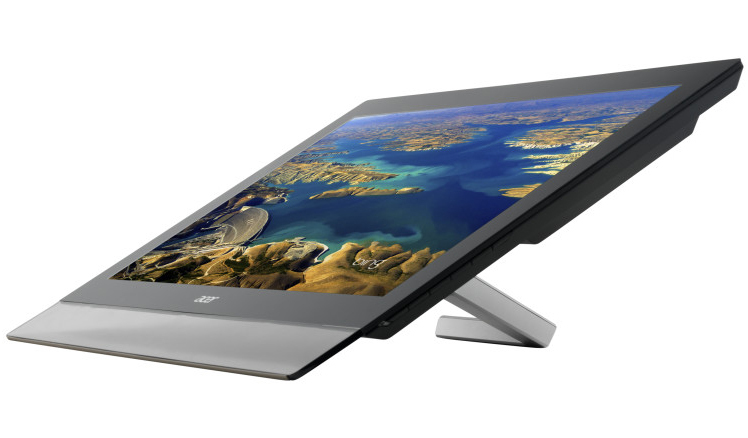 For me (and I suspect for many others) the touchscreen really does make a difference, and when it is as beautiful as the ACER, makes a visual statement too (it’s the first screen in the living-room my other half has actually approved of). And at a total cost of around $650 (for the computer and the screen, but not including the DAC), and a day or so to put it together, it’s no more expensive than a medium-priced CD player. Meridian, eat your heart out, but thank-you for giving me the inspiration.